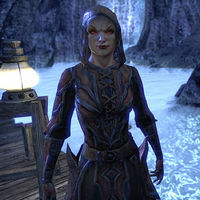 Lyranth is an outcast Dremora originally encountered bound inside the ruins of Ten-Maur-Wolk in Shadowfen, where her essence is being harvested by the Dominion in order to create skin-stealers. You are given the option to free her in exchange for information, or leave her bound. Regardless of your choice, she can later be encountered at the Tower of Lies, and will help you free the members of the Fighters Guild imprisoned down there. She will approach the Tamrielic expedition outside the Reaver Citadel and offer a way to break the Daedric defenses during the quest The Citadel Must Fall. Once inside, she will offer to open the barrier protecting the Endless Stair in return for killing Valkynaz Seris and allowing her banished clan to return to power in Coldharbour. 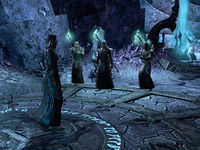 Lyranth is also found in the Imperial City Prison, where your group must help her defeat Lord Warden Dusk in order to reclaim the animus of her clan. She can be first encountered within the Tower of Lies standing on the small docks. Daedra don't usually speak to mortals. "Pity. To think they'd miss out on this fascinating conversation." However if you previously met her in Shadowfen, you will mutually recognize each other. "You seem determined to make yourself useful. What strange habits you mortals have." "Really? Most mortals look alike to me. Plus, there's that smell. The odor of warm blood and quiet desperation. Mildly unpleasant, if you don't mind me saying so. Ah, wait a moment… I do remember you." "The mortal continues to speak to me. What does it want, I wonder? Perhaps if I ignore it, it will just go away." You were imprisoned last time, too. I helped you. "I assure you, contrary to the way it looks, imprisonment is not my usual situation. But before you get any ideas in that mortal little head of yours, I do not need your help this time." I'm helping the Fighters Guild find a way out of here. "How fortunate of you. I shall enjoy observing how you go about accomplishing that particular miracle." After you have made you way to the upper levels while looking for Captain Eilram, she will appear again, idly playing with a fireball. Why do you care what happens to me? "Even if I cared to explain myself to you, I doubt that you would understand. The politics of Oblivion are much too convoluted for your primitive mortal mind to comprehend." Can you help me free the Fighters Guild? "I will not hinder you, dear mortal. Consider that to be enough help for now. Know this, however. The exit from this place is currently… unavailable. I suspect you will rectify that in the near future." After finding Eilram's sword, she will appear as you make your way to Captain Arakh's camp. 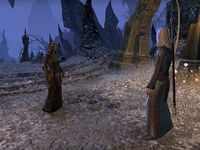 Once you have found both of the Captains and brought them proof of your sincerity, they will argue about whether Ifriz is a Fighters Guild member or a Dremora until Lyranth suddenly interrupts. You can then speak with her to find out what she wants. "We share a common problem, little mortal. It only makes sense that we work together to solve it." Speak to her again and she will say "Ifriz is never far from his beloved barrier. Hurry and end this so that we can both get on with our existences." Once Ifriz is dead, she will congratulate you on beating him. Lyranth: "You and I will meet again, I think. I look forward to seeing what trouble you get into next." As you first approach the Reaver Citadel, you will witness Lyranth talking to Vanus Galerion. After you begin you mission to storm the Citadel, Lyranth will appear as you approach the stairs. You can talk with her to see what she meant earlier. "Ah, little mortal! While it might be entertaining to watch you bumble about the Citadel, I would much rather just see you get about your business. I'm sure that whatever you have planned will ultimately work in my favor." "Right to the point? How distressful! Oh, very well. You seek a way into the Citadel, one that won't attract any undue notice. As it happens, I know just the thing. If you follow the east wall, you'll find a branch that leads inside." "Never look a gift daedroth in the maw, little mortal. I offer information, nothing more. The warded building you seek is near the main gate. The kyn will try to stop you. If they don't succeed, we will speak again." Does this have anything to do with what you were doing at the Tower of Lies? "Ifriz had information I needed. It ultimately led me here. I enjoyed what you did to Ifriz, little mortal. I'm looking forward to seeing what mayhem you stir up here." If you talk with her again she will remind you of her directions, "The old Fighters Guild Hall. It's near the main gate. Go!" Once you are inside the citadel, she will appear once more. You have the chance to ask her why she keeps assisting you. "And so, the little mortal, once more into the breach! I believe the Ayleid King wants you to find a hidden key. Hurry! I think your friends have already made it into the sealed hall." Why isn't this break in the wall guarded? "How amusing! The little mortal suspects a trap. You are wise to fear the duplicity of Dremora, but I assure you that you are safe enough. Illusions hide this area from the kyn. Just a little trick I recently picked up." "Technically, I am helping you, not them. But this constant desire to know the why of things grows tiresome. I don't want to confuse you. Just know that I have a debt to settle. As long as helping you advances my goal, I will continue to do so." "The look on your face! How precious! You are dismayed. Why should the truth upset you? You benefit from my assistance, just as I benefit from yours. Patience, little mortal, you shall see. Now off with you. Nothing will come of us standing here." What can I expect inside the Citadel? "Death, most likely. The kyn that guard this Citadel will try to kill you. It's generally what we do. The old hall you seek is near the main gate. If I were you—and, most thankfully, I am not—I would make my way there, posthaste." "I'm impressed, little mortal. Hardly a scratch on you!" "A smart investor keeps track of her investment. The fighters surprised the kyn and might even win the day. Bravo! But once you control the Citadel, what then? How will you get past the Labyrinth without the proper key?" "Ill-informed, impulsive … mortals! Did you think you could just stroll up to the portal you seek? The Valkynaz guards a key to the maze beneath Molag Bal's stronghold. You must pass through this Labyrinth, and to do that you need the key." I'll get the key from the Valkynaz. "Finish your original quest first. Help your mages. Banish these kyn to the darkness that spawned them. It is no less than they deserve. Then meet me at the pyramid. Only I can help you acquire the Labyrinth key." If you talk to her again, Lyranth will say, "Don't mind me, little mortal. It's just that I find you so … fascinating!" After you have opened the portal to let the Mages Guild reinforcements in, Lyranth will be at the entrance to the Reaver Citadel Pyramid with Gathwen and Cadwell. "Only those of Daedric blood may enter the pyramid, little mortal." Can you open the way for us? "I told you that you'd need my help. A Daedric ritual locks this door, and only a willing offering of kyn blood will open it. I am your key to Valkynaz Seris. You are my key to vengeance." Will you help me in the coming battle? "That I cannot do, little mortal. If the Valkynaz is banished by my hand, I will lose honor and standing. If you kill him, however, I remain true to my word. And Seris abides in the darkness with my lost clan until Coldharbour allows him to return." Why do you seek vengeance? "My clan was destroyed. Erased from this existence. And the hand that orchestrated that destruction was Valkynaz Seris. He thought my clan was a threat to his power. Whatever the right or wrong of it, Seris must pay for what he did." Lyranth will then peform the blood ritual to open the door. Lyranth: "The way is open. Destroy Seris. Painfully. He deserves whatever horrors you decide to inflict upon him." If you speak with her again before entering she will ask you to get on with it. "Well, little mortal? What are you waiting for? Must I hand you an engraved invitation? Get inside and do what you came here to do!" After you slay Seris, Lyranth will enter the pyramid. Lyranth: "My lost clan awaits Seris in the darkness. Even though the blade that banished him was not in my hand, his end was my doing." Lyranth reunited with her Clan. With a flash of light, the chamber will be filled with Dremora cheering for Lyranth. You can take the key or you can speak with her to learn the full story—or what she deigns to give you. "Even by kyn reckoning, I have waited a long time send Seris into the darkness. Allow me to savor this moment, little mortal." So, now you're the Valkynaz of the Citadel? "What possible interest could that be to you, little mortal? Let me guess. You're worried that now I will order my kyn to destroy you. I assure you, a change in leadership can be a time of confusion. No harm will come to you or yours—for now." Are you happy now that Valkynaz Seris is dead? "Kyn do not die. Seris has been banished to the darkness. Long ago, our clans were locked in war. Seris, through treachery, banished my clan. Everyone but me. I accepted a blood oath to remain free, promising that my hand would never harm him." But you asked me to slay him. "I remained true to my oath. I helped you enter the pyramid. Nothing more. Indeed, the ignominy of a mortal sending Seris to the darkness was most gratifying." Will you help us assault the Endless Stair? "My goal was revenge. I have no interest in your squabbles. Understand, little mortal. A kyn's desire to spill mortal blood never ebbs, even if we don't always act upon it. I am what I am. If we meet again, I will smile as I take your life." Once you take the key, she will thank you for the assistance. Lyranth: "You have been a most useful weapon, little mortal. Take the labyrinth key, with my thanks." If you talk with her afterwards, she will suggest that you leave soon. "You proved very useful and earned the assistance I provided you. But I wouldn't recommend lingering in my territory, little mortal. I cannot vouch for the patience or control of my newly awakened kyn." 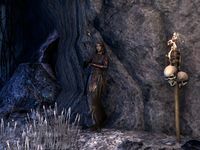 Lyranth can be found fiddling with a skull near the side entrance to the prison. "A mortal wandering here of its own volition? And it can fight! A daring soul! Perhaps you'd like to help me complete my day's work. I seek to attack this prison, lay low the Daedra who run it." "Why does your kind do anything? Perhaps you want to see what spoils you can mine from this place. Or maybe you want to help the mortals trapped deep below. Your kind has such baffling sensibilities." There are people trapped here? "So many! Held for torture, for parts. For amusement. You can't hear the screams from up here, but I assure you they are uttered." "I'll lead you to the prisoners if you'll assist me in my day's butchering. Information has a price, little mortal. Head inside, slay the Overfiend, and anything else that bars our way to the inner halls. Then we'll talk." Why do this? You're a Daedra? "And? Mortals kill mortals, do they not? I see it every day. Such atrocities you commit against each other given proper incentive! We do the same. We do it better." "He was like you, once. Mortal and small. But the aura of this place changed him. You'll see. His death is necessary if we're to reach the inner halls." Defeating him will allow us to free the prisoners trapped below? "You'll find plenty of prisoners to free if you survive. Perhaps they can serve as distractions as we move deeper. Every Daedra here will come to stop you, little mortal." What happened to this prison? "It holds prisoners as it always has. But the torture chambers below have been made exquisite. They belong to Lord Bal now, run by his … trusted lieutenants. It should have been my clan in charge." "One thing at a time, mortal. Let's see how far you get. The Overfiend is waiting." missing dialogue for if you have previously met her. Once the Overfiend is dead she will call out to you your next target. Lyranth: "The Flesh Sculptor is your next target. Go! His laboratory is just up ahead." When you arrive at his flesh pit, he will have a brief conversation with Lyranth. Ibomez the Flesh Sculptor: "Have you brought me these mortals as gifts, Lyranth? I'm flattered." Lyranth: "Let's see if you're still blushing when we stick your head on a pike." After the Flesh Sculptor is slain Lyranth will tell you your next target on her list. Lyranth: "The Gravelight Sentry is all that remains between us and the Warden." You can talk to her at this point. "Your will to survive is impressive. With the Sculptor gone and none to command the prison's flesh constructs, the Warden's sword is broken. There are wretched mortals in the cells up ahead. Free them if you must, but you face the Gravelight Sentry next." What if I free the prisoners and just walk away? "That would be Daedric of you! You owe me nothing, and you'd have your mortals freed. But do you know how many they process here in a day? In a week? The screams are endless! If you want to put this place out of power, there's more work to do." What is this Gravelight Sentry? "Can't you tell from his name? You mortals think in such … three dimensional terms." I want to know what I'm up against. I'm sure you've noticed the myriad watchers that surveil this place. Through these children, the Sentry sees all that we do. Useful in the operation of a prison. Slay it, and the Warden will lose his eyes in these halls." 'Why are you after the Daedra in this prison?" "I wondered if you would live long enough to ask that. You have proven most amusing." "They wronged me. I've come to wrong them back." You were waiting for a bodyguard to just happen by? "You are powerful for a mortal, but surely you jest. We Daedra have established practices and I required a third party. Let's leave it at that. We've wasted enough time." After you kill the Flesh Abomination. Lyranth: "In my experience, flesh atronachs are tools of the dim-witted. Get moving. The way out is ahead, past the last cell block." Lyranth: "Let's see how you handle the Warden's traps. You'll have the pleasure of meeting him if you survive." Lyranth: "The Warden is your final obstacle. You'll find him ahead." You can talk to Lyranth before fighting the Lord Warden. "You're so desperate to live on, short as your lifespan is. I'd be impressed if it weren't so futile. Only the Warden remains. You could turn and run now, if you'd like. After all you've seen. But I think you'll push on. Go! Slay him! Or die trying." Tell me about this grudge you bear against the Warden. "He took something from me long ago, and I plan to take the same from him." "Why do you bother with this? Expelling so much air from that hole in your face? You're much more amusing when your life is being threatened. Let's see more of that!" After killing the Warden, the animus in his armor will released, freeing Lyranth's fellow Dremora. "The Warden is dead. His prisoners freed. What fun this has been! You've done well, for such a fleeting creature.<I have found a new, and very slight, respect for mortal-kind." "You live to fight another day! Treasure it! I have much work to do. Someone's going to have to look after this prison for Lord Bal. This trinket is for you. I've infused it with the animus of the great Lord Warden. Take it and go." After receiving your reward you can ask her for some explanations before leaving. "We're through here, mortal. Your presence is no longer required. It would behoove you to leave, in fact." "What more do you want, little mortal? You've won. Broken the Lord Warden's power. Lord Warden. What an absurd title you give yourself. But it's time you left. This prison still belongs to Lord Bal, and someone needs to run it for him." Tell me why you wanted to attack the Warden. "Long ago, he captured the animus of my clan, sealed them within the armor he wore. Today, I did the same to him. My clan is free now. Free to return, as Daedra do. Don't you know retribution when you see it, mortal?" Lyranth is the author of Oath of a Dishonored Clan, and also answered questions in the Loremaster's Archive. She also wrote the Crafting Motif 63: Dremora.